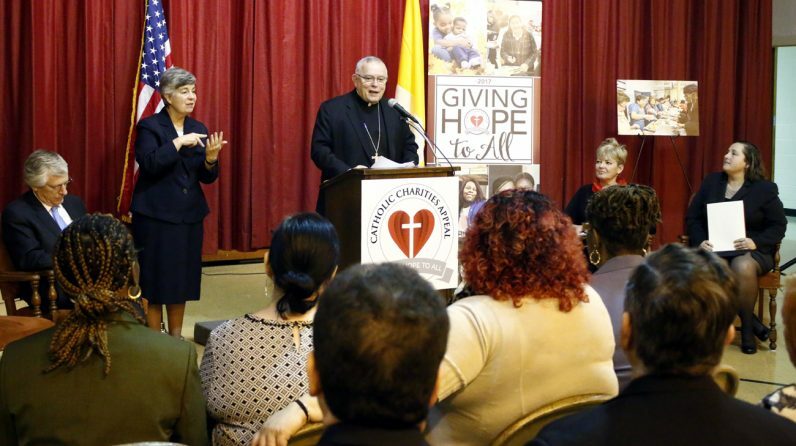 The Catholic Charities Appeal, the largest annual fundraiser for the Archdiocese of Philadelphia, raised $10,126,472 last year in what was the fourth consecutive year to pass the $10 million mark. That total and other details were included in the final report for the 2016 appeal. Among the highlights was a new initiative for the appeal, “New Vision Partners,” through which 852 donors gave $1 a day and raised $311,000. The goal for this year’s appeal is $12.5 million and that is attainable, according to Gina DeColli, spokesperson for the Catholic Foundation of Greater Philadelphia, the group charged with conducting the appeal. So far the campaign has raised about 58 percent of the goal, she noted. This includes 1,765 new donors and 4,111 who have returned after being away for more than one year. Also, 33 parishes have already reported reaching their goal. Not included in this figure are proceeds from several large bequests which raise the total to approximately 77 percent of goal. In 2016 no less than 180 organizations and ministries within the archdiocese received assistance through the campaign and this year there should be at least that many grant recipients. Catholics in Philadelphia have been doing the Lord’s work through charity for a least 220 years, well before there was an Archdiocese of Philadelphia or even a diocese. The first recorded Catholic collective charitable effort was in 1797 in the wake of the horrific yellow fever epidemic that killed 10 percent of the city’ population. Laity in the city got together and raised sufficient funds to pay for foster care for orphaned children of the epidemic. In 1814, after the founding of the diocese in 1808, Sisters of Charity arrived from Maryland to take charge of a small orphanage next to Holy Trinity Church. Over the years many other congregations of women and men arrived to assist in the care of orphans, the neglected, widows, those with disabilities, the sick and the dying. Generally speaking each institution relied on the generosity of donors to contribute to their particular charity. It wasn’t until 1958, under Archbishop John O’Hara, that a formal combined drive was conducted, with a goal of $1.5 million. The very successful drive raised over $2 million, which was a very substantial sum at the time. That would equal approximately $16.9 million in today’s dollars. Fifty-nine years later and the Catholic Charities Appeal is still going strong even if the needs have evolved over time. Perhaps the greatest difference is a general trend away from institutional-based programs to community-based programs. Certainly such Catholic Social Services institutions as St. Edmond’s Home for Children, Divine Providence Village, Communities of Don Guanella and St. Gabriel System still exist and are recipients, but non-residential beneficiaries have emerged, including the seven Family Service Centers and the Out of School Time programs. Another difference is today’s drive also addresses ministries that would fall under the spiritual works of mercy, along with the aforementioned corporal works of mercy. For example the Newman apostolate in the region’s colleges, cultural ministries of the archdiocese and evangelization programs. But most of the funds raised still address the traditional needs of people. The 2016 appeal marked another transition. It was the final year of successful leadership and growth under the leadership of James P. Quinlan who has now been succeeded by David B. Ripsom as board president. “Over the past six years I had the pleasure of watching the Catholic Charities Appeal truly make an impact on the lives of thousands throughout the Archdiocese of Philadelphia,” Quinlan wrote in the Annual Report. Learn more about the Catholic Charities Appeal of the Archdiocese of Philadelphia by visiting the website catholiccharitiesappeal.org. Mr. Albert T. Chadwick, Jr.
Mr. and Mrs. Dominic S. Genuardi, Jr.
Mr. J. Eustace Wolfington, Jr.
Deacon and Mrs. Paul R. Kern, Sr.
Mr. and Mrs. Edward P. Lemanowicz, Esq. Mr. and Mrs. Edward J. Monahan, Jr.
Mr. and Mrs. Edward J. Roach, Sr. Most Reverend Charles J. Chaput, O.F.M.Cap. Mr. and Mrs. William J. Devlin, Jr.
Mr. and Mrs. Paul Gazzerro, Jr.
Mr. and Mrs. Dominic Genuardi, Sr.
Mr. and Mrs. Ralph M. Gotshall, Jr.
Mr. and Mrs. Robert J. Riethmiller, Jr.
Mr. and Mrs. Robert N. Werwinski, Sr.
Dr. and Mrs. Richard P. Baker, Jr.
Mr. and Mrs. Charles E. Barton, Jr.
Mr. Thomas D. Cassidy, Jr.
Mr. and Mrs. Lawrence E. Donato, Sr.
Mr. and Mrs. Joseph Doyle, Jr.
Mr. and Mrs. John T. Frain, Jr.
Dr. and Mrs. John R. Johannes, Ph.D.
Mr. and Mrs. Earl Kelly, Jr.
Mr. and Mrs. John A. Krieg, Jr.
Mr. and Mrs. Donald E. Mantell, Jr.
Mr. and Mrs. Robert F. McCadden, Jr.
Mr. and Mrs. John S. McManus, Jr.
Mr. and Mrs. Harold Olafson, Jr.
Mr. and Mrs. Harold J. Pickar, Jr.
Mr. and Mrs. Joseph L. Rose, Jr.
Mr. and Mrs. and Mrs. Richard P. Smith, Jr.